"If the shortest distance between two points in over the hill and not around them, that's the way to go. What in the hell did we own a geared locomotive for anyhow? Big Creek & Telocaset 3-truck Heisler #5 with three cars somewhere on the line. H.R. Griffiths photo, Ivan Ergish collection, reproduced from the Winter 2000 issue of Tall Timber Short Lines magazine with permission. In 1890 the Grande Ronde Lumber Company commenced harvest and sawmill operations in Perry, Oregon, about five miles west of La Grande. Their harvest operations expanded westward along the Grande Ronde river drainage. However, by the mid-1920's the company had run out of available timber and started looking for a new home. They focused on the Medical Springs area forty miles southeast of La Grande, and before long the company had sizeable timber holdings in the area. Around 1924 or 1925 the company started building a new sawmill on the banks of Big Creek a short ways west of Medical Springs. Any sawmill of any lasting consequence needed a community to house and feed employees, and the company started building such a town. The town received the name Pondosa, a variation on Ponderosa Pine, the primary tree species found in the area. The sawmill also needed transportation to the outside world, and to that end the lumber company built a railroad running from Pondosa to Telocaset, the closest point on the Union Pacific mainline. The new railroad headed east from Telocaset up the Antelope Creek drainage for about four miles before leveling off at a summit area, where a passing siding was built. The railroad then decended into the Spring Creek drainage on a five percent grade, passing a large spring near the headwaters of Spring Creek where the company established a camp for the section gang. The location became known as "Jap Camp" after the Japanese laborers that filled most of the jobs on the section gang. From "Jap Camp" the railroad headed east, passing through another saddle and then dropping into the Beagle Creek drainage. After leaving Beagle Creek the railroad dropped into the Big Creek drainage, where Pondosa and the new sawmill lay. The railroad stretched 11 miles between the two end points. On 28 September 1927 the U.S. Postal Service established a post office in Pondosa. By the following year the Grande Ronde Lumber Company sawmill at Pondosa was in operation, with a daily production capacity of 50,000 board feet. 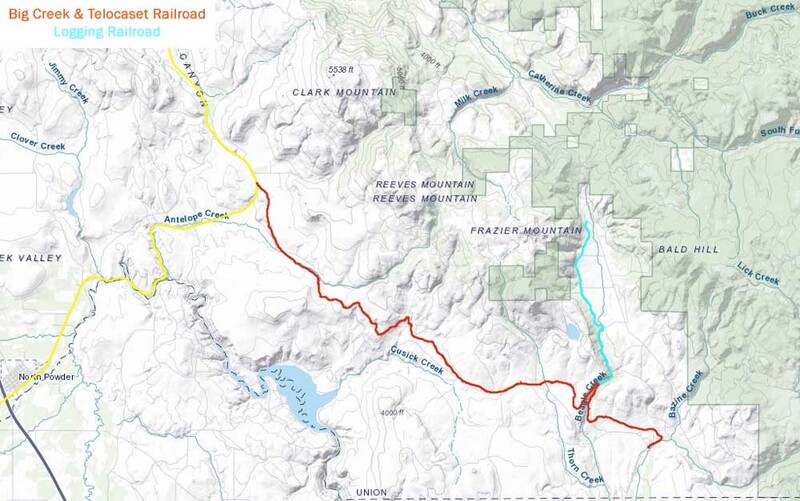 The company built a logging railroad to bring raw logs to the mill, with at least one source placing that logging railroad as running up the Beagle Creek drainage. Abbey's, a timber industry guide and publication of the time, credited the lumber company with 17 miles of railroad. The 1928 Timberman guide reported 20 miles of railroad built with 45 to 52 pound rail, with three geared locomotives, two speeders, and 24 flat cars rounding out the equipment roster. The logging operations used one steam donkey, two Holt logging tractors, one set of big wheels, 40 horses, and 100 men in harvest operations. The small enginehouse that housed GE 44-ton diesel #106 as it appeared on 7 June 1959. The old enginehouse is visible in the background. Ivan Ergish photo, John Henderson collection, reproduced from Winter 2000 issue of Tall Timber Short Lines magazine with permission. 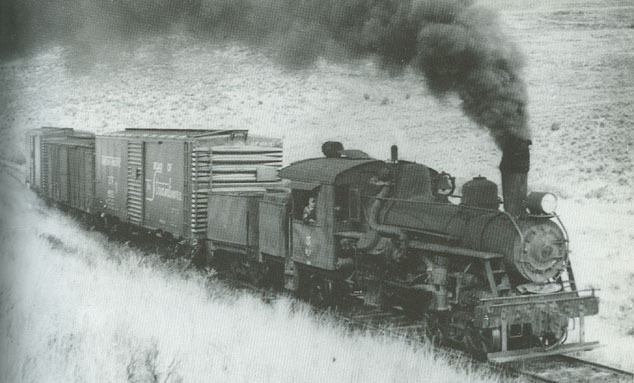 In 1929 the lumber company incorporated the Big Creek & Telocaset Railroad to provide common carrier service on the 11 miles between Telocaset and Pondosa. However, by about this time the owners of the Grande Ronde Lumber Company had decided to sell out, and in late 1930 or 1931 the Collins family purchased all operations, including the railroad. The Collins family had sizeable timber holdings scattered all over the U.S., with several operations in northern California and Oregon. Under Collins ownership the Pondosa mill, and the BC&T as a result, continued steady operations. Through the next several decades the mill's daily production ranged from 50,000 to 75,000 board feet each day. Two or three geared locomotives at any one time provided the needed motive power. The railroad operations continued to expand, with the 1941 Timberman guide reporting 35 miles in operation. The 1941 guide also reflected the changing technologies used in the woods- the donkies and big wheels of a decade previous had been replaced with six trucks, two tractors (possibly the Holts reported in 1928), two shovels, and one bulldozer. The railroad continued to burn wood slabs in the locomotive until around 1942, when the company leased a Shay from the nearby Mt. Emily Lumber Company for a brief period. The Shay was an oil burner, and having it on the line convinced management to convert the BC&T locomotives to burn oil as well. By 1943 the parent organization had a new name, Collins Pine Company. Trucks completely replaced the logging railroad in either 1942 or 1943. The lumber company brought its bunk cars down into Pondosa where they were removed from their trucks and converted into employee housing. During the last years of logging railroad operations the train crew would take empty log cars up to the landing, where they would then become the loading crew. Once they finished loading the cars the men would return to the locomotive for the journey back to the log dump at Pondosa. Operations on the BC&T were about as laid back as a railroad could get. The line existed only to transport finished lumber from the sawmill to the Union Pacific interchange tracks at Telocaset and return with more empties. The average BC&T train consisted of one locomotive and three to five cars, which would just about carry the entire daily output of the Pondosa mill. Livestock movements provided the only real variety in BC&T freights, but such movements were of little lasting consequence in the overall picture. Trains ran with a crew of three men, an engineer, a fireman, and a brakeman-conductor. Their routine was simple- fire up the locomotive in the morning, collect the lumber loads from the mill loading dock, and start west. At "Jap Camp" they would pause long enough to split the train in two, as the five-plus percent grade from there to the summit made it impossible for even the geared locomotives used to haul an entire train up to the top of the hill. The crew would then move the train up the hill in sections, with the train re-assembled at the summit siding for the rest of the journey on to Telocaset. During the wood burning days the railroad burned slabs- waste products from the sawmill- in its fireboxes, and to provide fuel along the line the company owned a couple slab cars that would be filled at the sawmill and then left at various spurs along the line. Crews needing some extra fuel would pause at these slab cars long enough to refill their tenders. However, a general conversion to oil fuel by the end of the steam era ended this practice. 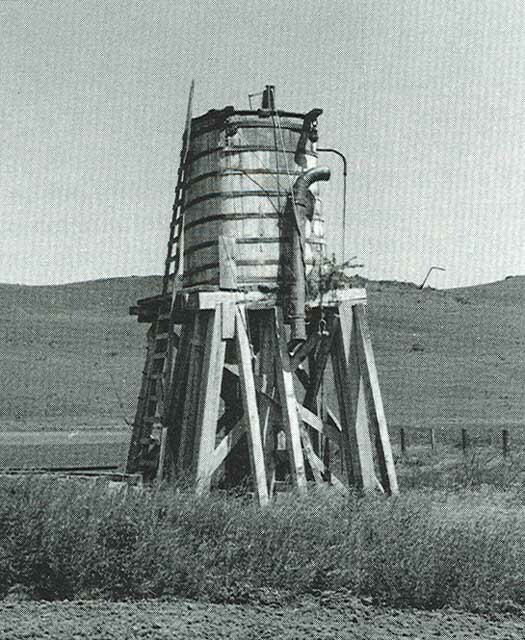 The old water tank at Telocaset on 7 July 1956. This tank outlasted the railroad by several decades and has only recently fallen down. Ivan Ergish photo, John Henderson collection, reproduced from the Winter 2000 issue of Tall Timber Short Lines magazine with permission. Operations changed little through the late 1940's and through the 1950's. In 1948 or 1959 a corporate restructure changed the name of the parent organization again, this time to the Collins Pondosa Lumber Company. Modernization finally caught up to the railroad in 1955 when Collins moved a little General Electric 44-ton switcher up from one of their operations in California. Although small, the little diesel-electric performed the job adequately. Its arrival caused the company to eliminate the fireman job, as his services were no longer needed. The affected employee found a new home firing the boilers that kept the sawmill operating. In February 1959 the Collins family sold the Pondosa operations, including the BC&T, to the Templeton family. Like Collins, the Templeton interests were another family-owned forest products company. They were no strangers to Oregon, as they already owned the nearby Mt. Emily Lumber Company in La Grande as well as the Valsetz Lumber Company and the affiliated Valley & Siletz Railroad in the coast range. However, the Templetons were to have only a brief tenure over the Pondosa operations, as they closed the Pondosa mill forever on 1 May 1959. Without a further reason to live the town of Pondosa died a quick death, and on 5 May 1959 the company auctioned everything in the town off. By 1961 only a few buildings stood to mark the site of the town. The BC&T died along with the sawmill. The notice for the public auction to be held on 5 May 1959 included the little GE switcher, along with an extra traction motor, battery charger, bull gears, engine heater, and front and rear snowplows; a Northwestern speeder with a V-8 gas engine; a speeder trailer car; and railroad parts, supplies, and tools "in quantity". By the end of 1959 only the grade and a few scattered structures remained to mark the little railroad's existence. All told the little railroad handled around 18,000 loads of lumber, cattle, sheep, hogs, and occassional mill supplies during its three decades of service. The grade can still be seen and followed today, and the old water tower at Telocaset remained standing until recently. Although the Templetons listed the GE diesel in the auction notice, the Templetons instead transferred it west to their operations in and around Siletz, OR. However, within a year they would exit the timber industry for good, with timber giant Boise-Cascade taking over. The Collins family operations are still in the timber industry, with sawmills and other forest products plants scattered through southern Oregon and northeastern California. The now almost-forgotten town of Pondosa, OR, and the timber industry and railroad jobs it supported for three decades are little but a part of their colorful history. Telocaset today, a half century after the Big Creek & Telocaset passed from the scene. A UP freight rolls eastward past the site where the Heislers and little GE delivered lumber to the mainline. Photo by and courtesy of Dan Schwanz. Big Creek & Telocaset is in red, known logging railroad trackage is in green. The orange line is the Union Pacific mainline. #5- 3-Truck Heisler, c/n 1501, built 3/1924. Cylinders 7x15, Drivers 38", Weight 80 tons. Built as Ostrander Railway & Timber Company #5, Ostrander (Kelso), WA; to Big Creek & Telocaset #5 1940. Still present on line July 1959; likely scrapped. #102- 2-Truck Heisler, c/n 1053, built 11/1901. Cylinders 15x12, Drivers 36", Weight 37 tons. Built as Debois & Bond Brothers #1, Bond, Maryland; to Grande Ronde Lumber Company #102, Perry, OR. Transferred to Pondosa operations. To Stoddard Lumber Company #102 1930; eventually became Big Creek & Telocaset #102. Likely scrapped around 1955. #103- Lima 2-truck Shay, c/n 2241, built 11/1909. Cylinders 10x12, Drivers 29.5", Weight 50 tons. Built as Grande Ronde Lumber Company #103, Perry, OR; Transferred to Pondosa operations. To Stoddard Lumber Company #103, Pondosa, OR, 1929. Disposition unrecorded. #104 - 2-Truck Heisler, c/n 1496, built 1/1924. Built as Grande Ronde Lumber Company #104, Perry, OR; transferred to Pondosa. To Stoddard Lumber Company #104 1930; to Grande Ronde Pine Company #104 1931. Collins transferred locomotive to Almanor Railroad, Chester, CA, in 1941. To Whitney Co., Tacoma, WA, circa 1947. Scrapped. #106- General Electric 44-ton diesel switcher, c/n 28340, built 12/1946. Built as Almanor Railroad #106, Chester, CA; to Big Creek & Telocaset #106 1955. 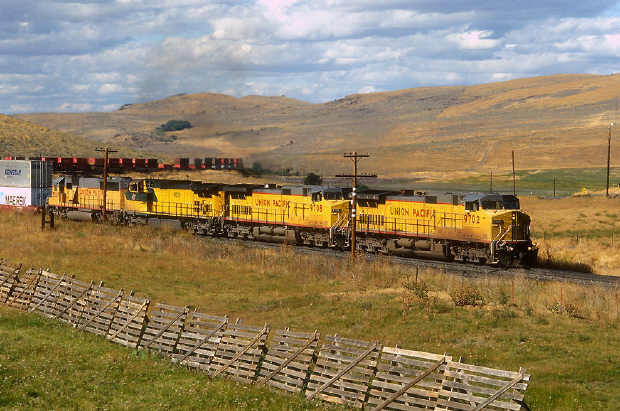 Transferred to Valsetz Lumber Company #1, Valsetz, OR 1959; to Boise- Cascade #1, Valsetz, OR; to Valley & Siletz Railroad #8, Independence, OR; to Stimson Lumber Company, Gaston, OR in May 1985. Acquired in 2009 by Oregon Coast Scenic Railroad, Girbaldi, OR, and moved to Tillamook, OR, for storage. Data compiled and provided by John Taubeneck from Abbeys Loggers Blue Book (A) and Timberman Guides (T). Listings should be considered to reflect the year prior to report. In terms of production, "M" represents 1,000 board feet. A1928: 17 miles railroad; 52 lb. rail; 6% grades; 3 geared locos; 2 speeders; 1 donkey; 2 tractors; 80M logging production; 100 men; 50M mill output. T1928: 20 miles railroad; 45-52 lb. rail; 6% grades; 3 geared locos; 24 flat cars; 1 donkey; 2 10-ton Holt tractors; 1 set big wheels; 40 horses; 100M output; Perry mill still listed. A1930: 17 miles railroad; 6% grades; 3 geared locos; 2 speeders; 1 donkey; 2 tractors; 80M output; 100 men. A1940: 2 geared locos; 5 trucks; 2 tractors; 1 steam donkey; 1 shovel; 1 bulldozer; 70M output; 225 men(?). A1942: 2 geared locos; 5 trucks; 2 tractors; 1 steam donkey; 1 shovel; 1 bulldozer; 70M output; 225 men. T1944; 1947-same as 1943, but 140M logging output and 70M mill output. 50th Anniversary Pondosa, Oregon Pictorial History, 1959-2009 by Fred Ringer, Jr., Ring Publishing, McMinnville, OR, 2009. "Big Creek & Telocaset Railroad" by John Henderson, Winter 2000 Tall Timber Short Lines: Pgs 32-38. "The Life and Times of the BC&T, Over the Hill...Not Around Them" by Don Daughs, September 1973 NMRA Bulletin: Pgs 46-50. "Almanor Railroad" by Don A. Hansen, October 1964 Pacific News: Pgs 3-6. Some information from these webpages was also used in the creation of this site. Pondosa page on Oregon Genealogy Website Interesting aerial view of the Pondosa sawmill. Note a Heisler locomotive with several boxcars rolling into the mill near the top of the photograph. Pondosa, Oregon 50th Anniversary Page Includes several good photographs, mostly of the sawmill, along with information on how to get a photo book of Pondosa.